G Master design combines extraordinary sharpness and smooth Bokeh in one lens. It is not easy to achieve spatial frequency of 50 lines pairs per millimeter at a lens's widest aperture and produce smooth beautiful bokeh at the same time, but that is Sony's baseline for G Master design. Unprecedented resolution and other demanding design parameters yield outstanding reproduction of the most detailed subjects and scenes with superior contrast throughout every frame. G Master resolution is simply the highest in its class. 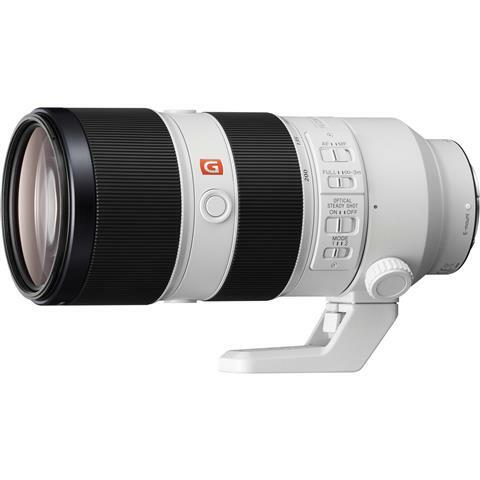 Class-leading close-up performance with a minimum focusing distance of 37.8” and 0.25x maximum magnification is ideal for portraits, telephoto macro, and more. Contributing refinements include ED glass elements and a floating focus mechanism to control aberration that can be problematic in close-up applications. When making movies you’re frequently focusing while shooting, either with autofocus or manual focus. A lens that has not been designed with movies in mind might exhibit “breathing”, or variations in the angle of view while focusing which can be a jarring distraction. The SEL70200GM features an optical design and control technology inherited from Sony’s professional camcorders that ensure minimal focus breathing. Zooming is a fundamental moviemaking technique that is used for both practical framing changes as well as creative effect. Parfocal means the SEL70200GM holds focus on a subject even when zooming in or out. High-performance image stabilization is built right into the lens for sharp, blur-free images with a wide range of subjects. The heavy stabilization lens is driven by a linear motor for fast, precise stabilization. 5-axis image stabilization becomes available when used with α series bodies that feature built-in image stabilization. To provide the greatest possible benefit from the built-in image stabilization system in the widest range of shooting situations, the features switchable MODE 2 stabilization allows image stabilization to be used with panned shots for greater clarity and impact.